A very long time ago I worked in the bindery of a printing company, whose main business was menus for local restaurants. So the content was not very interesting, especially since I had little money to eat out then, but the process of printing was fascinating. I learned how to operate an industrial paper cutter, which could be programmed to make the right series of cuts to trim down the large sheets of paper that came off the press to the exact size of the final product. The layout department was responsible for figuring out how many could be printed on one sheet of paper, which was affected not only by the finished size but also by the grain of the paper (important for folding), photos or artwork which needed to bleed to the edge, the extra marks needed for alignment in four-color printing, and the necessary margin for the press and the paper cutter. When cut down, some of the trim would be turned into scratch pads or even used on a smaller press, but a lot of it would go into the large paper recycling carts. I scavenged reams of paper during the year I worked there of various sizes, weights, and colors. For years this provided me with material to make my own greeting cards and stationery. I still have a surprising amount of paper left, partly because I stopped making my own cards and haven’t been writing as many letters as I once used to. Recently I looked at my paper collection and thought about how else I could use it up. I realized that a couple stacks of approximately half-sheet size would make nice chapbook sized blank books if folded themselves in half and add a soft cloth cover to each. 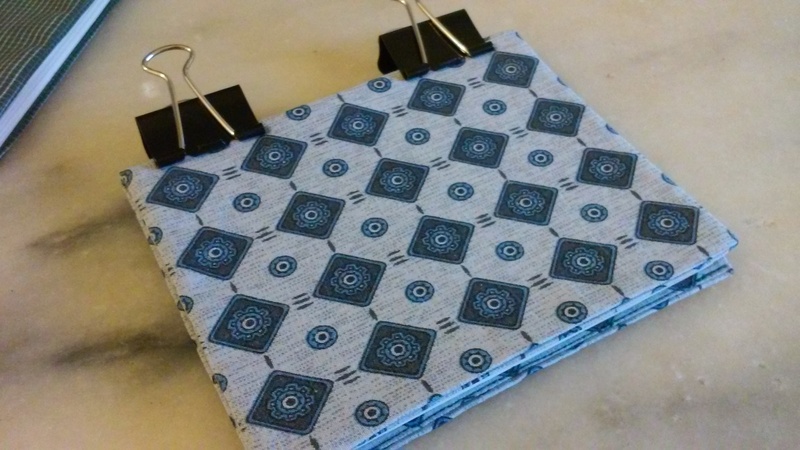 I made one as a prototype: Six sections of four sheets folded in half and sewed along the fold (by machine, to limit the amount of hand work I’m doing). I glued the sections together on the spine with a strip of cloth to help hold it together. The cloth cover is a pocket design, so I could insert a sheet of card stock to make it a little stiffer. This was glued again on the spine to the inner paper block. I had my doubts that this glued binding would actually hold up with use, so I started writing in my prototype blank book and carried it around in my daypack for several days. The binding is totally solid thus far, so I was ready to make more that I could have as gifts. At the same time I was going through my bookshelf, selecting ones to get rid of, and found my copy of the London A-Z map book from the mid-80’s. This seemed too out of date to be of use to anyone, so I happily tore off the binding when I saw that it could be cleanly disassembled. The sheets from the map book were slightly smaller than my blank sheets of paper and I felt that I could interleave a map sheet with each subsection of the book without having to do any additional trimming. 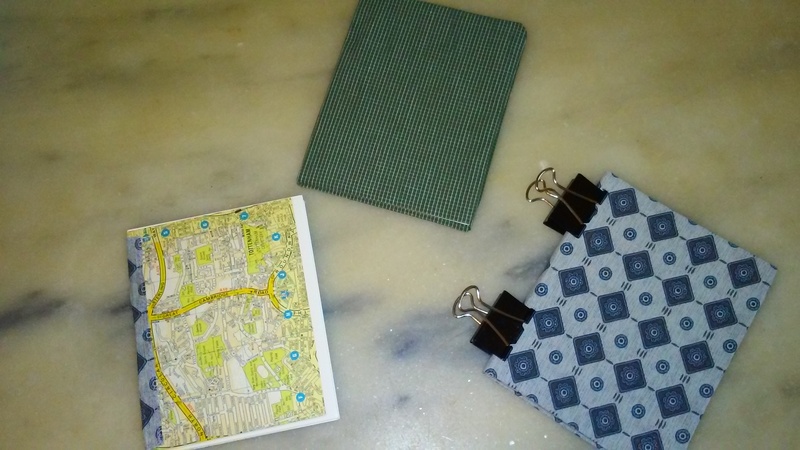 So two of the three blank books that I made next were interspersed with random sections of maps from the greater London area. For some reason this detail makes me very happy. The zipper on my wallet failed, which wasn’t surprising given that it’s been installed in two wallets and has probably been used for almost ten years. The first wallet was a woven one from Guatemala and I used it until the material gave out. Then I made a felted one – knit with purple wool (with light green border), and then tossed it in the washing machine with hot water to shrink and felt it. And I took the zipper out of the first one and sewed it in the felted one. Fantastic. That lasted me for several years, until now when the zipper has gone out on it. 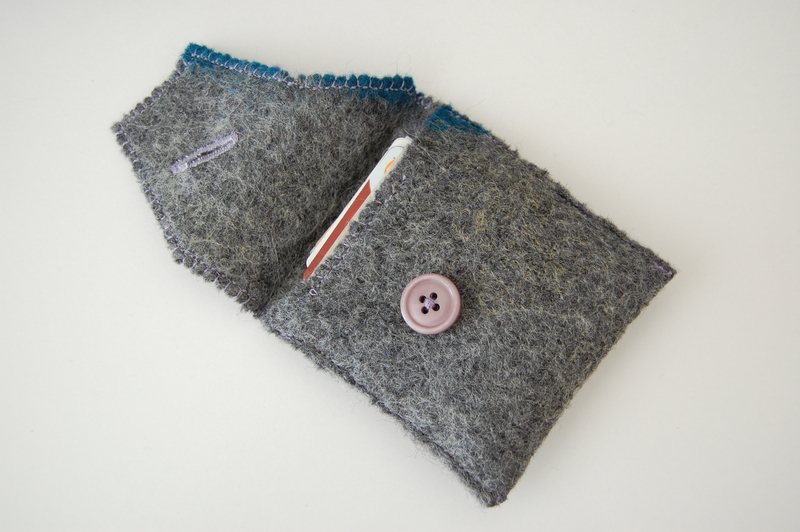 I’ve got another zipper to put in (the felted wallet itself looks softer but is still sturdy and usable), but haven’t got around to ripping out the old zipper yet – and am a little intimidated by sewing in the zipper. 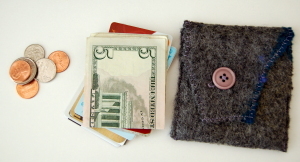 But I need a wallet of course, so I dug through my scraps of felted wool (from other projects) and found a big enough piece that I could make a simpler wallet with a flap and one button to close it. I made this in one evening, though I went back later and ripped out the seams so I could put in a lining, plus sewed an overcast stitch around all the edges before sewing it closed. I’m still intending to replace the zipper in the other wallet, but this will make a good backup one. Why would anyone tailor an undershirt? I wanted the practice (I still feel like a beginner with my new sewing machine, even if I’m perhaps tackling complicated projects), and I wanted my baggy undershirts to fit better. I bought a package of three a while ago and wore them a few too many times before I realized that I really should have gotten a size smaller and then it was too late to exchange them. It’s annoying to wear an undershirt that’s actually bigger than the nice shirt you’re wearing over it, so needless to say, these undershirts were always the last ones used. And in my typical fashion, I didn’t do a lot of planning before I started cutting and sewing the first one. I got out an undershirt that actually fits me well and put it on top of the baggy one – both size large crew necks from Hanes, but the baggy one was several inches wider in both the body and the sleeve. This gave me a general pattern/size that I was shooting for. For the first one I didn’t cut off the sleeves entirely, as I didn’t feel ready to tackle that kind of re-engineering yet. I just cut up each side and the bottom of each sleeve and trimmed a bit and resewed the seams (like an upside down L). This gave a better fit for the body, but the top of the shirt (where it joins at the sleeve) still hung a couple inches down my arm. I also shortened the length of the body, since I’m short waisted and the baggy undershirt was several inches longer than it needed to be for me (I felt like I was reaching for mid-thigh, tucking it into my pants, although that’s a bit of an exaggeration). I wore the first one and waited several days before working on the remaining two. This gave me time to think about whether I was going to use the same technique or whether I would try to make the shoulder cap/sleeve fit better too. I figured this would be good practice for attaching sleeves, something I’ve never done before. So I cut up the second shirt, removing the sleeves and cutting up the sides of the body. Jersey is ridiculously stretchy, and I struggled to keep the material smooth without stretching it out. Mass produced items are not always symmetrical. 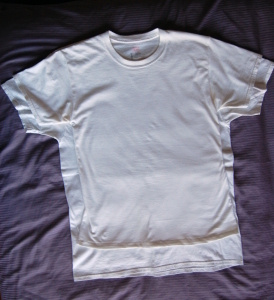 But even something as ubiquitous and simple as a t-shirt would be a complicated garment to make by hand! The 3-point seam under the arm is a pain to do. It’s important to have the fabric pieces cut to the right size (with even seam allowance all the way). There’s usually an order of operations for which seam should be sewn first and which after. I trimmed the sleeves a little bit to fix the symmetry problems and then shortened them in width. I reduced the top of the shirt in width (at the sleeve cap? I suppose I should start learning the right names for these things). I waited to trim the body until I had sewn the sleeve seams (the sleeve back together and then attaching the sleeve to the body). On one sleeve I got the material bunched up and had to rip out a small portion of it and redo, but mostly I worked slowly and carefully and it came out okay. When I first did the seams for the body I just did a straight line down from the armpit. But then I tried the shirt on and realized I could make it fit my body since I now had a seam where there hadn’t been one before. So I did the top part of the seams a second time to curve them in, like inverted parentheses )(, leaving the hips wider. Perfect! By the time I got to the third shirt I started to feel like I knew what I was doing. Probably if I had more than three shirts to modify I might not have been interested in doing them all – I enjoyed this project because I was figuring it out and learning as I went. And now I have three undershirts that I will happily wear until they wear out. I stopped eating gluten almost a year ago. Initially I did a flurry of baking experimentation with gluten-free flours, because I was used to baking and eating tons of bread. 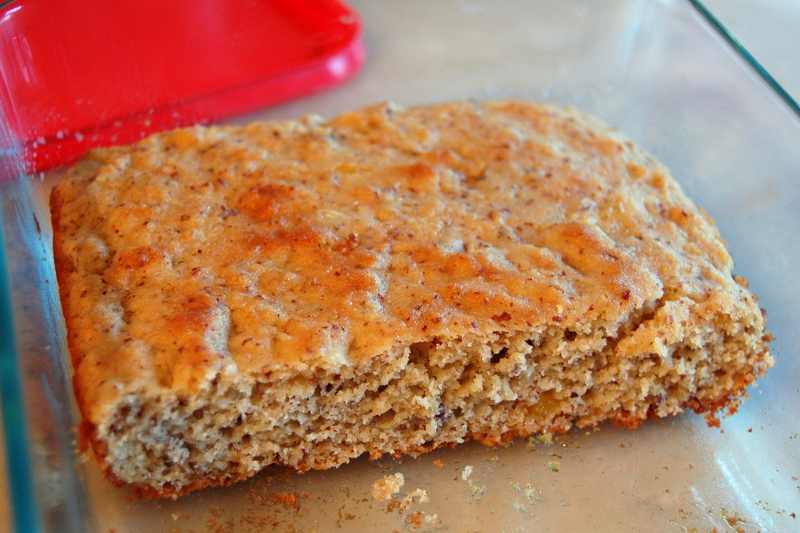 I came to the conclusion that I was not going to find a satisfying bread substitute, but for a while I was making crackers and pancakes and tortillas as well as sweet breads and cookie bars. I became somewhat adept at using gluten-free flours, but I also gained weight and had low energy. I stopped baking and started eating meat, lots of it, along with more nuts. I’ve also tried to eat more vegetables and fruits, but have less success keeping that up, though am still eating more of those than I used to. I lost weight and I have a lot more energy. It’s a semi-paleo diet that I’m doing, because I still eat some grains and sugar. I’ve resorted to a few tricks to keep myself from eating sweets and high carb items. I try to make single serving desserts, like one dish of fruit crisp in the microwave, so I’m not tempted to eat several servings at once. I don’t bake cookie bars on a regular basis anymore. But the other night I was craving something more than my single serving of plum crisp, so I made some banana almond bars. I was going with what I had on hand – the idea for the recipe came from the 1/2 banana that I had – and so I baked this in a smaller pan (6″ x 8″). 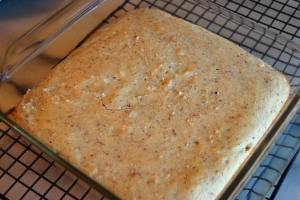 There are two versions of the recipe here, the first is what I baked in the smaller pan, and the second is for a standard 8″ x 8″ pan, with a few tweaks. Initially I wanted to do this without any added sugar, but for the first batch I added the jam because I thought the dough tasted pretty lifeless. On the second batch, I eliminated the jam, used more banana and added a dash of cinnamon (so no added sugar). On the other hand, if you keep the jam, other flavors beside peach that I would recommend would be apricot or orange marmalade. Not sure about berry jams like blackberry or raspberry – maybe. Both times the dough started rising while I waited for the oven to heat up. So maybe the baking powder could be reduced more, but they both turned out pretty tasty with good texture. I think any gluten-free flour blend could be used instead of the rice flour, and this would probably work without the xanthan gum. Beat eggs, oil, and banana thoroughly. 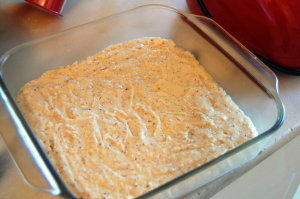 Mix the dry ingredients separately, then blend into the egg mixture along with the almond extract. 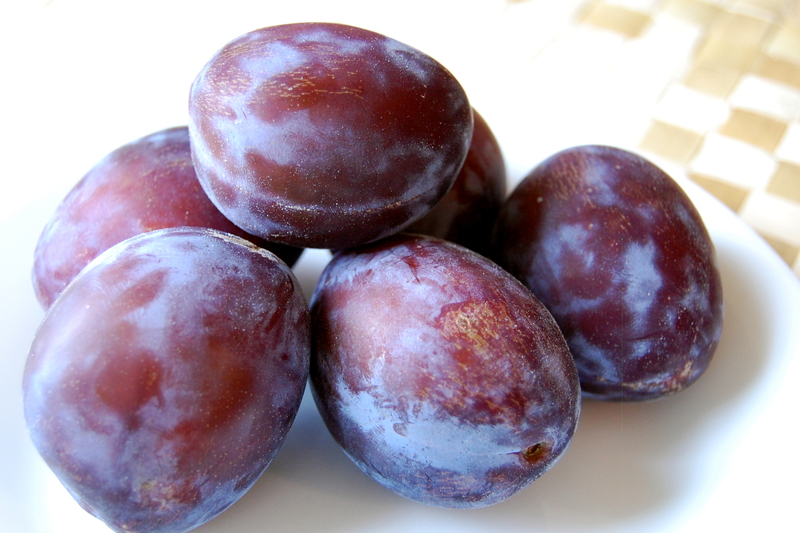 If using, fold in the jam at the end – it doesn’t need to be fully blended in. Pour into greased pan and bake at 350 F (175 C) for 18-20 minutes (use toothpick test). Cool on rack. Makes about 16 bars. 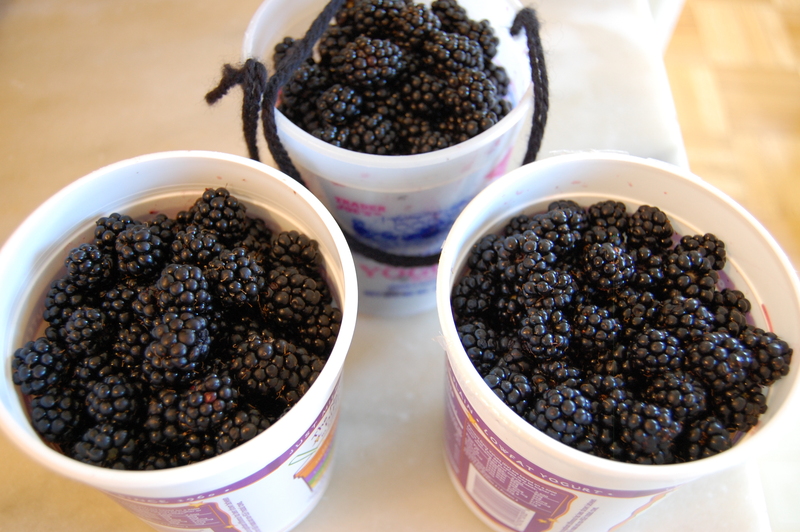 I lost count of how many times I went blackberry picking in August. Enough times that I started to run out of room in the freezer for all the berries I was picking. I knew that I was going to make jam, but I didn’t want to do it on the same day as picking. Last year I made jam on a rainy day in September, using berries that had been recently picked and frozen, but I remembered that thawing and de-seeding the berries had been a bit of a hassle. So this year I de-seeded half the berries before freezing, and measured the pulp into freezer bags, so it would be ready to go whenever I got around to making jam. I’m also dealing with a repetitive stress injury on my left wrist (from knitting), so this helped reduce the amount of work I was doing with my wrists on any one day. I prepped berries on two different days, and for one batch I de-seeded them using a colander and for the other I squeezed the pulp through cheesecloth. The latter method is messier but quicker and seemed to be easier on my wrists, and is probably the method I’ll use in the future. 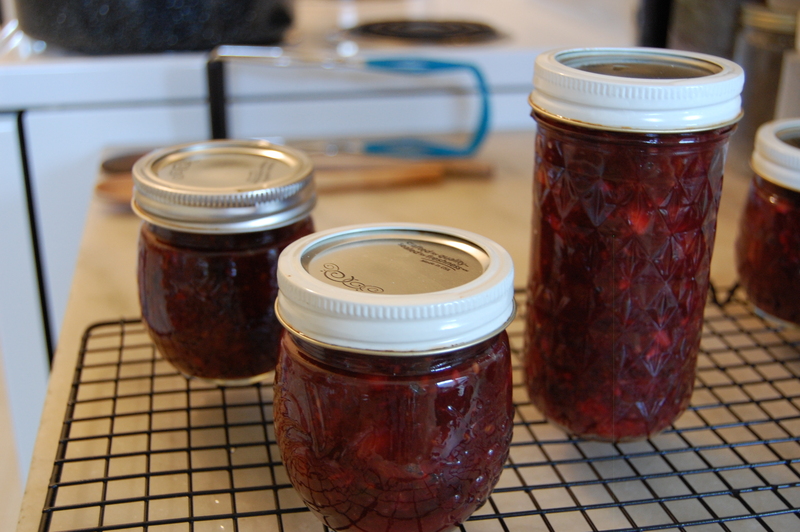 This past weekend was nice and cool, and I had already gotten used to canning with my batch of chutney, so I made two batches of jam on Sunday. Thawing the bags of blackberry pulp was easy, but pouring all the pulp out of the bags into the pot was not as easy. So I’m not totally enthusiastic about this method; maybe I should freeze the pulp in yogurt containers or something similar that would be easy to scrape out? This year was the first time in quite a long while that I’ve used added pectin in the jam recipe; other years it’s just been blackberry pulp + sugar. When I go through the USDA’s canning guide (all sections linked here), I become leery of modifying the fruit to sugar ratio, but at the same time I’m not thrilled with how much sugar is required. So this year I got the type of pectin for reduced sugar recipes. But even with that, I thought the amount of sugar called for was excessive: 4 cups of sugar for 5 cups of berry pulp. So I reduced the sugar a bit from that; 3.5 cups sugar and a bit more than 5 cups of crushed berries. And then that made me feel anxious about whether the jam would set, so I cooked the first batch longer than the needed 1 minute after it reached a roiling boil. I haven’t opened any of the canned jars yet, but I suspect the first batch will be too stiff. I stuck to the prescribed cooking time on the second batch. Doing two batches back to back wasn’t too difficult. The time consuming part was sterilizing the jars, which was probably an unnecessary step since they were being processed for 10 minutes in the water bath canner. 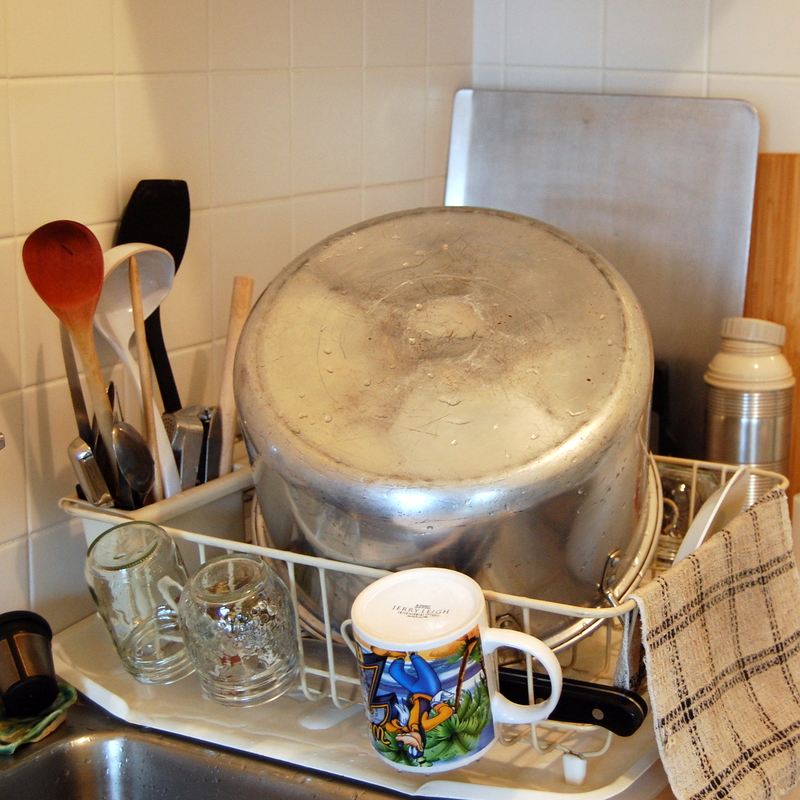 But that gave me time to get dishes done in between! End result: 13 half-pint jars of jam. 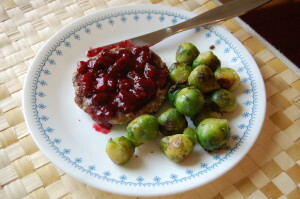 This is the recipe I created – it cooked up in about 45 minutes and made five and a half jars (half pint sized). I reduced the amount of sugar and cider by about half from the recipes I was looking at, and am quite pleased with the result. I water bath canned the full jars for 10 minutes and am enjoying the partial one now!